Press Release - San Pedro, Ambergris Caye, Belize - Monday, February 25th, 2013 - Tropic Air has officially announced that on Friday, February 22nd, after ten months of work, Tropic Air received a license from the Government of Mexico. Tickets for this highly anticipated flight from Belize City International Airport to Cancun, Mexico, are now available for sale. 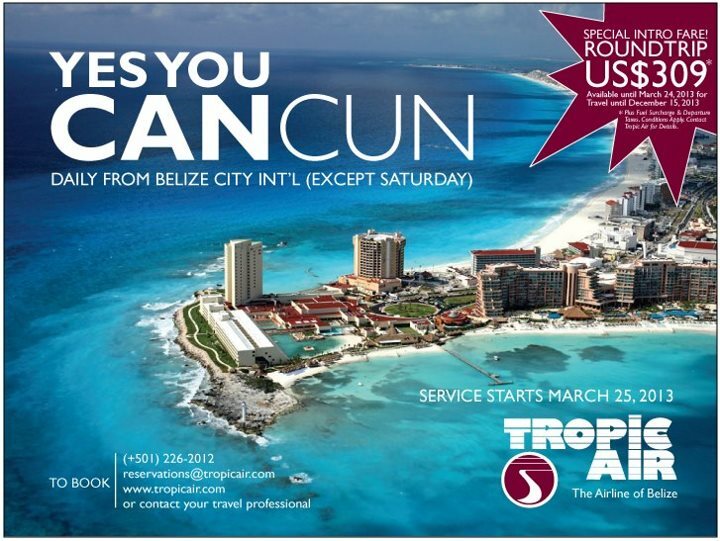 Effective March 25th, 2013, Tropic Air will launch 6 weekly flights (daily except for Saturday) between Belize City's Phillip Goldson International Airport (BZE) and Aeropuerto Internacional de Cancún, Mexico (CUN). Tickets are on sale now through March 24, 2013 at an introductory fare of $309 round trip from Belize City to Cancun for travel between March 25th, 2013 and December 15th, 2013. Fuel surcharge, taxes and other conditions may apply. Cancun is Tropic's first destination in Mexico and its third international route. Last year, Tropic added Belize City to San Pedro Sula, Honduras service to complement its existing daily Belize City to Flores, Guatemala route. This is in addition to its 11 domestic destinations within Belize. "Cancun is finally within reach!" said John Greif III, President of Tropic Air. “We expect the market for this service to grow rapidly and we plan to add additional service as that happens. In addition, European and Caribbean connections via Cancun will now be possible for passengers who wish to avoid the long drive from Belize”. The new service bookable via the web at www.tropicair.com, via e-mail at [email protected], by phone at (501) 226-2012, by contacting any of our stations, or your friendly travel professional. Tropic Air operates a fleet of 12 aircraft to 14 destinations in Belize, Honduras, Guatemala and Mexico, and carried over 230,000 passengers in 2012. For 34 years Tropic Air has been a leader in the airline business in Belize, and employs over 250 people.